Simpeak Electroplated Case for Apple Watch 42mm series 2 (2016) / Sport / Edition/Nike+ Models. Lightweight&Slim --- Soft and flexible material keeps your Apple Watch lightweight and easy to install, but also offered good protection. Thin minimal design is perfect for flaunting your new Apple Watch. 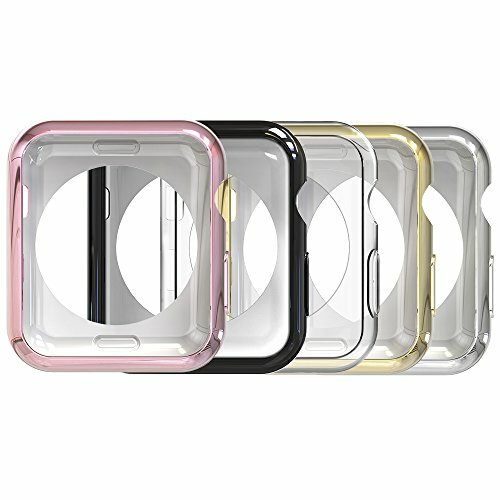 5 Color for Your Choice --- Come with 5pcs, 1x transparent, 4x Plating case(black, rose gold, gold, silver- which makes your case shinny), different watch band to change the diffferent color case.